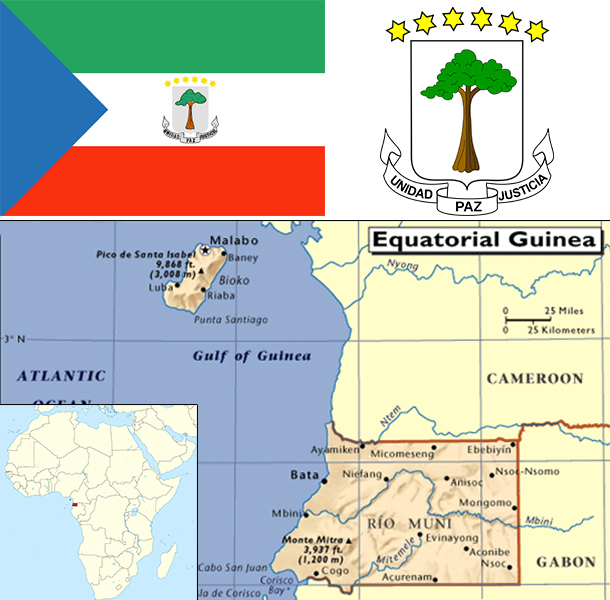 Equatorial Guinea gained independence in 1968 after 190 years of Spanish rule; it is one of the smallest countries in Africa consisting of a mainland territory and five inhabited islands. The capital of Malabo is located on the island of Bioko, approximately 25 km from the Cameroonian coastline in the Gulf of Guinea. Between 1968 and 1979, autocratic President Francisco MACIAS NGUEMA virtually destroyed all of the country's political, economic, and social institutions before being deposed by his nephew Teodoro OBIANG NGUEMA MBASOGO in a coup. President OBIANG has ruled since October 1979 and plans to stand for reelection in 2016. Although nominally a constitutional democracy since 1991, presidential and legislative elections between 1996 and 2009 were widely seen as flawed. The president exerts almost total control over the political system and has placed legal and bureaucratic barriers that prevent political opposition. Equatorial Guinea has experienced rapid economic growth due to the discovery of large offshore oil reserves, and in the last decade has become Sub-Saharan Africa's third largest oil exporter. Despite the country's economic windfall from oil production, resulting in a massive increase in government revenue in recent years, the drop in global oil prices has placed significant strain on the state budget. Equatorial Guinea continues to seek to diversify its economy and to increase foreign investment despite limited improvements in the population's living standards. Equatorial Guinea is the host of major regional and international conferences and continues to seek a greater role in regional affairs. Exploitation of oil and gas deposits, beginning in the 1990’s, has driven economic growth in Equatorial Guinea, allowing per capita GDP to rise to over $29,000 in 2014. Declining revenue from hydrocarbon production, high levels of infrastructure expenditures, lack of economic diversification, and corruption have led to limited improvements in the general population’s living conditions. Equatorial Guinea hosted two economic diversification symposia in 2014 that focused on attracting investment in five sectors: agriculture and animal ranching, fishing, mining and petrochemicals, tourism, and financial services. Undeveloped mineral resources include gold, zinc, diamonds, columbite-tantalite, and other base metals. Forestry and farming are also minor components of GDP. Subsistence farming is the dominant form of livelihood. Although pre-independence Equatorial Guinea counted on cocoa production for hard currency earnings, the neglect of the rural economy since independence has diminished potential for agriculture-led growth. Foreign assistance programs by the World Bank and the IMF have been cut since 1993 because of corruption and mismanagement and high GDP figures now make Equatorial Guinea ineligible for most donor assistance. The government has been widely criticized for its lack of transparency and misuse of oil revenues and has attempted to address this issue by working towards compliance with the Extractive Industries Transparency Initiative. US foreign assistance to Equatorial Guinea is limited in part because of US restrictions pursuant to the Trafficking Victims Protection Act.